Some classic car guys go out looking for the car they want. They shop hard to get the nicest one they can find with the most desirable drivetrain. With this 1970 Big Block Chevy, the shopping process came about in a much different order. How about beginning the process with an engine of choice. Then finding the appropriate host in which to install this dream engine. Of course, this includes modifying all of the systems on board to accommodate this choice drivetrain. This motorhead enthusiast began this mission knowing he wanted a really “BIG” big block Chevy and, that it should reside in a 1970 Chevelle. 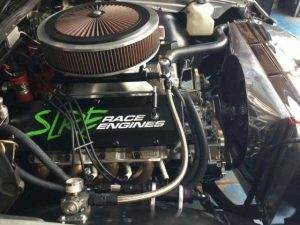 The engine of choice is a 632 cubic inch big block Chevy producing 800 horsepower on pump gas. A level three turbo 400 and a Strange 12 bolt, both built for massive torque, follow up this beast of an engine. The suspension components were replaced with a complete UMI suspension package. The brakes were upgraded with four wheel Wilwood disc brakes. A six-inch cowl hood was necessary to cover the Holley Dominator carburetor atop this mountain motor. 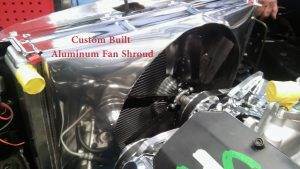 A custom aluminum fan shroud was built in-house to cool this incredible ride. No matter how you would like to approach your dream ride, we can make it happen.